This walk was done to walk up and tick off Cold Fell from the list of 2000 foot hills left to walk and to make a decent walk of it we decided on a route via Geltsdale and arrive at the summit from the south-west. Walkers who tick off lists and complete various heights of hills are often criticised but when l was doing the Wainwrights over twenty years ago l found out two things; dedication was a necessity and the benefit was that you visited many corners you would never normally get to by sticking to your favourites. The 2000 foot hills carry on this message and led us to discovering Geltsdale which was subsequently walked in detail on another walk. This walk commences at the hamlet of Tindale in the quiet countryside west of Lambley in the South Tyne valley. Years ago this area had some small coal mines and much bigger quarries and this is evident by the quarries which are visited on this walk and the derelict railways. One of these came to Tindale and its quarry before eventually joining the South Tyne Alston branch at Lambley not far from its superb restored viaduct. The South Tyne railway route from Haltwhistle to Alston is now a fine cycle and walkway. There is a small car park at Tindale which you leave on a bridleway which goes west and can be seen, (although not always obvious!) on the ground. After about half a mile you go through a gate and continue with the RSPB reserve of Tindale Tarn on your left. At Thorn cross the small road and continue in the same direction to just south of Clesketts where another railway track is met at a junction of old tracks. Take the track to Forest Head at spot height 264 where and then turn left (south-east). This path goes across a disused quarry where there is one dangerous quarry face (which can be avoided) and after working through the quarry you will arrive on the Geltsdale track at GR587570. This is a super track which winds round Brown Hill and heads south. There are immediate views up and down Geltsdale which heads west about here. The two shepherds cottages of Gairs are below you and the way south is very attractive and easy. Eventually after three miles you reach Old Water where a sheltered spot can be found. Here you turn left (east) up Old Water again on a good track which is followed on a gradual climb for over a mile. Around this stage the track disappears and we opted to reach Cold Fell which was somewhere above us by heading across the contours on a north-north-east bearing. The going here is very wet with hidden holes and demands respect. We aimed for Cold Spring at GR605546 but never found it, but this was no problem as by keeping on a north-east bearing you eventually come to the fence separating Tynedale from Geltsdale. In retrospect next time we will try to follow Old Water to the fence at GR618539 (to the north of Great Blacklaw Hill) and follow the faint path alongside the fence. 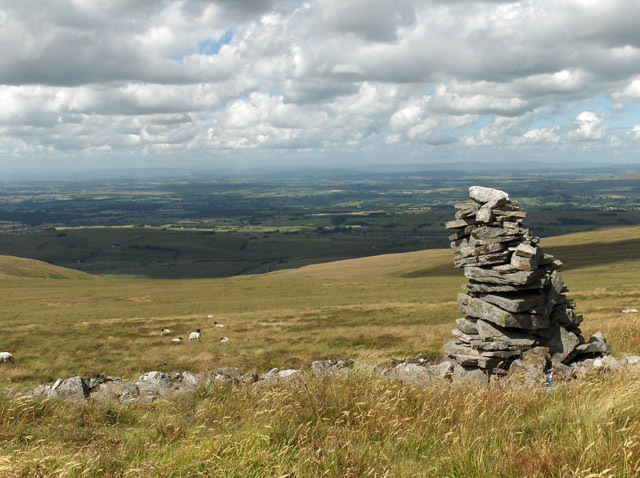 The summit of Cold Fell is interesting since it has rocks, which is a rare feature hereabouts. Leaving the summit you can descend in a north-east direction alongside the fence (with good views to the north) to a sheepfold at GR611562 and then head north-west over virgin territory for less than half a mile before picking up a track which was used for shooting in the past. I am not certain whether the RSPB now permit this as the area is a good breeding ground for waders. The track downhill is a beauty, especially after some of the more difficult ground already walked and arrives at Howgill Farm after one mile. Ahead is Tortie but we take the footpath (which is waymarked and good underfoot) alongside Howgill Beck and past Stagsike to arrive at the RSPB office at Tarn House. This is a lovely area which can be strolled on a short day and the excellent footpath continues past the tarn and to the south of Tindale Quarry. At the end of the quarry you leave the old mine track and pass Doleshole to arrive at the A689. Here you turn left over Woodend Bridge and up the minor road at Riggfoot Farm back to the start. This walk is at times hard but is rewarding for the quality of the country and the wide open spaces. This entry was posted on Wednesday, February 23rd, 2011 at 2:18 am	and is filed under Durham 2000ft Hills.